Here's the story of a thrice-refashioned dress! It wasn't a terrible dress to begin with , but the left sleeve was almost sliced off, dangling from a strip at the wrist. I also didn't like the way it was longer in the front than the sides. That kind of fit is never flattering, IMO! I was forced to cut off the ends of both sleeves to get them to an equal length. The knit fabric didn't require any finishing after it was cut. While I was at it, I also cut the front to more or less follow the line of the bottom hem in the back. That was a mistake, because it made it so short I could no longer wear it as a dress. Even as a tunic, I felt it was too short in front. I had a few yards of cheap black lace I'd ordered online for the express purpose of lengthening things that were too short, so I sewed it onto the bottom hem of the tunic. Unfortunately, it was so cheap that it had a stiffness to it that was entirely unsuitable! 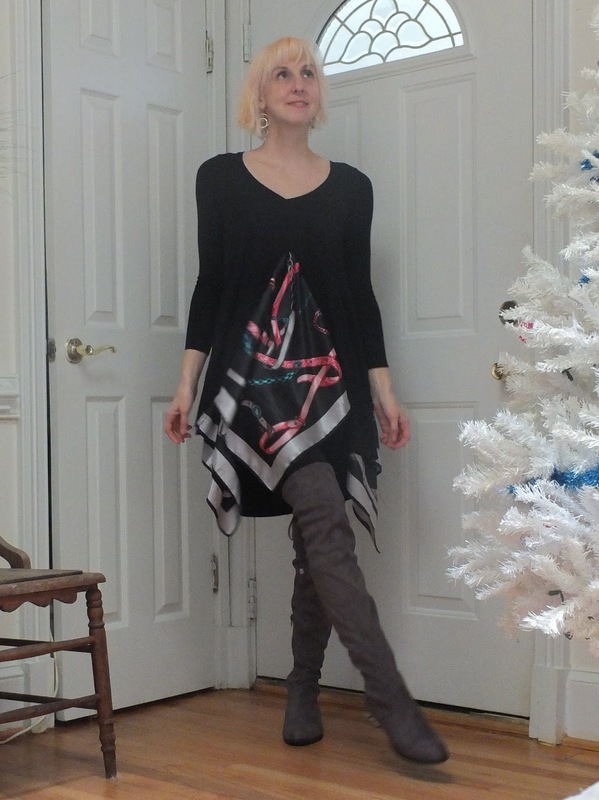 It didn't drape nicely, and it stuck to my legs and bunched up when I wore it over leggings. I picked off all the lace after my first wear. Lesson learned: if you find 5 yards of lace for 46 cents, you'll probably get what you pay for! For my second attempt at adding length to the front of the tunic, I thought I would insert a contrasting panel there, and on the sides for balance. I feel like I got this idea from something I saw on Refashion Co-op in the past, though I can't remember what or when, so here's a collective thank-you to all my fellow refashioners and your brilliant ideas! I used a square scarf, which I'm reasonably certain was a Chanel knock-off. If it was a real Chanel, I still don't feel too bad for slicing it up, because I'd been trying to sell it for months with no takers. It took me three tries, but I finally had something I was comfortable wearing in public! More details on my original blog post, which also happens to kick off a week-long series of outfits featuring butchered names of days of the week, if that's your cup of tea! This is completely adorable on you. I love it. That looks great on you and i love the idea.